Kelly Mac checks in on facebook and says... "I just got the word that 107-3 JAMZ (WJMZ- Greenville, S.C.) will be adding the The D.L. Hughley Show to our On Air Talent Roster. D.L. Hughley will air from 3pm-7pm Monday thru Friday. Considering this new addition, management has decided to move me to the Midday Slot 10am-3pm M-F & Vicky James will move to the night show 7pm-12am. I appreciate your continue love & support!" Kelly Mac previously served as Assistant Program Director and Music Director for WUSL Power 99 FM and 105.3 WDAS-FM in Philadelphia. She also briefly held down the midday host chair at V103 WVAZ and was APD at WGCI in Chicago. Before that, she served as 107.3 JAMZ's midday host for five years. 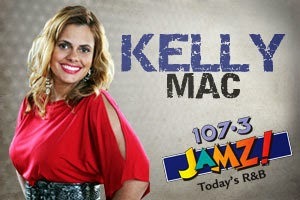 A native of Cleveland, OH, Kelly Mac began in radio in 1999. She started as a part-time receptionist for Radio One, Inc. From there, she later became Programming Assistant at WZAK-FM and WENZ-FM in Cleveland. After that, she was able to become an on air personality, something she had always dreamed about. Between her start in Cleveland and her most recent jobs in Philly and Chicago, Kelly Mac has worked in Charleston, SC, and Mobile, AL as well. The programming changes at 107-3 JAMZ begin Monday, October, 7th.